This activity will review that one simple rule and provide some examples to apply this rule. Check out this fun and spooky Halloween worksheet all about apostrophes. Your child will read the story and add in the missing apostrophes. Have you figured out apostrophes? After learning this super easy rule for how to use possessive apostrophes, students will gracefully dance their way through any expression that shows possession. This reporter needs help punctuating her report! Can your child help her? In this worksheet, she will have to punctuate the paragraph with apostrophes. Does your second grader know the difference between "your" and "you're"? 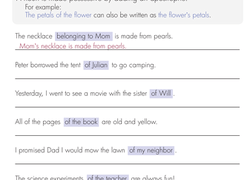 Guide her by matching definitions and finishing some sample sentences.